Netflix plans to spend more than $6 billion on programming next year. It's become one of the biggest houses on the TV block. For other networks, it's hard to keep up. That is one takeaway from The Hollywood Reporter's annual TV executive roundtable. The "titans of TV" panel: Richard Plepler of HBO, Josh Sapan of AMC Networks, Nancy Dubuc of A+E Networks, Ted Sarandos of Netflix and Bonnie Hammer of NBCUniversal Cable Entertainment. "That's starting to absolutely kill us poor people here in basic cable," said Bonnie Hammer, chairman of NBCUniversal cable when the discussion turned to Netflix's deep pockets. "If we want to keep amazing talent, it's raising our bar in terms of what we have to put out." Hammer oversees 10 networks under the NBCUniversal umbrella, including USA Network, home to the Emmy-nominated "Mr. Robot." This year, Netflix (NFLX) made headlines for reportedly spending more than $120 million to make Baz Luhrmann's period musical drama "The Get Down," which premieres August 12. Nancy Dubuc, president and CEO of A&E networks, acknowledged that offering competitive production budgets can be a "headache." But she said the choice often comes down to whether or not a project is a good fit for a given brand. "They want to know who is seeing it. They want to know they are speaking to a specific fan base and a specific audience they're making their craft and their stories for," she said. And there's the quality issue -- big budgets don't always produce hits. HBO Chairman Richard Pleper added: "As everybody here knows, just spending a lot of money..."
"...doesn't mean it's great television," Dubuc finished. Nor does it mean higher ratings. Dubuc pointed to her networks' high-rated unscripted programming -- which is generally much cheaper to produce than anything scripted -- as proof of that. High profile on-screen and behind-the-scenes talent also does not guarantee a hit. HBO's "Vinyl" is a case in point. The series executive produced by Martin Scorsese, Mick Jagger and seasoned showrunner Terrence Winter. It was initially picked up for a second season, but HBO opted not to move forward with the series. "We took a look at where we were, and the fundamental question on the table was, 'Could it be great?' You have to answer that very coldly and honestly," Pleper explained. "And if you come to the conclusion that it's going to be a better version of good and, given how high the bar is, [and that there's] something of a target on the back of that show, we collectively made a decision, 'Let's move on.' Those are difficult decisions, but that's what we get paid to do." Even Netflix has found that "budgets don't always drive grandeur," said Ted Sarandos, Netflix's chief content officer. He pointed to the success of "Stranger Things." "These are brand-new flmmakers, the Duffer Brothers, and with a cast of complete unknowns," Sarandos said. "Winona Ryder and Matthew Modine complement them, but these kids are out of nowhere." 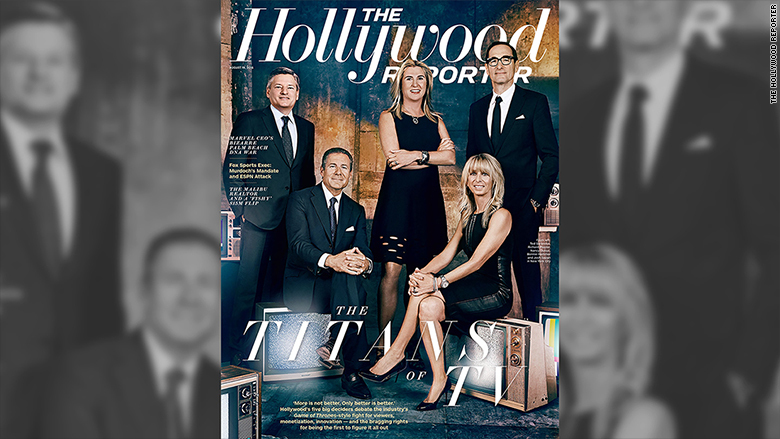 The latest issue of The Hollywood Reporter is available now.